Serv4fx.com Review 2019: Is Serv4fx.com a Good Hosting? 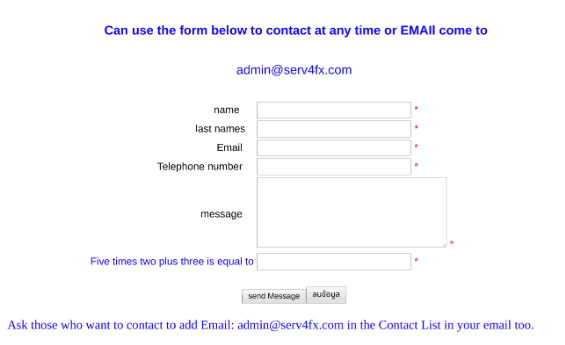 Serv4fx.com is a Thai company selling VPS plans for forex trading. Its fully customizable, affordable plans use HDD storage and don’t offer an uptime guarantee. Serv4fx.com is a Thai company that specializes in VPS hosting for foreign exchange (forex) trading. You’ll know what this means if you really need it, otherwise you can look away now. This vendor’s very basic website is available only in Thai. Serv4fx.com sells a choice of RDP plans that allow access to trading accounts from anywhere in the world, with the benefit of the VPS server always having a high-speed and uninterruptable internet connection to the backend brokerages. There is a choice of VPS plans with a variety of different server locations so you can choose to have data held in the U.S., U.K., Germany or the Netherlands. As well as selecting a server location, you can either select a base plan or configure a package to your exact needs by adding CPU cores, RAM, HDD, or LAN. Notably, the plans use the increasingly out-of-favor HDD storage instead of the ten times faster SSD storage, and Serv4fx.com will not take any responsibility for backups (so it’s up to you to take care of that). If uptime is important to you, you should keep in mind that there is no advertised uptime, and – since the servers are co-located – you could experience slow response times to technical issues. Finally, this vendor’s hosting plans do not allow BitTorrent, Camfrog, or other illegal websites to be used. It’s hard to compare the prices with other similar companies because it’s rare (but not unknown) for a hosting vendor to focus on VPS solutions for forex trading. That said, the prices seem comparable with regular VPS companies. Plans are only available on monthly terms, so there are no discounts for long term commitments. The company also reserves the right not to refund you except if it fails to provide the promised service. Signing up is a two-stage process of sending your payment by bank transfer, then contacting the team to begin the setup process. So there are no easy options for signing up simply online. There is no indication of this vendor’s business hours or expected response times. Customer service is limited to email and online form (which amounts to the same thing), but my attempt to initiate an email conversation, in English, received no response. There are a few informative articles on the vendor’s website, but not enough to be much use. Serv4fx.com sells a range of VPS forex hosting plans that support MetaTrader 4 (MT4) access via RDP. This is a specialist hosting type, which means you’ll know what it is if you really need it. Wondering how Serv4fx.com stacks up against other Web Hosting companies? Enter any other Web Hosting company and we will give you a side-by-side comparison.